I can’t believe Easter is in less then two weeks! How did it get here so quickly? This past weekend I realized just how close it is to Easter and started to panic a bit. I go to my parents house every year for Easter so I don’t have to cook dinner but I am the person who makes dessert. We also celebrate my mom’s birthday on Easter every year since it’s always close to Easter. I like to make my mom an Easter basket that doubles as a birthday gift. That means putting in all of her favorite things. I also needed to make a dessert that is part Easter dessert, part birthday dessert. 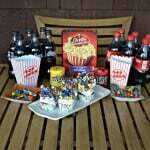 I headed over HERE to get some inspiration for my Easter basket as well as to find some fun Easter desserts. After finding some great ideas I headed up to do some shopping. 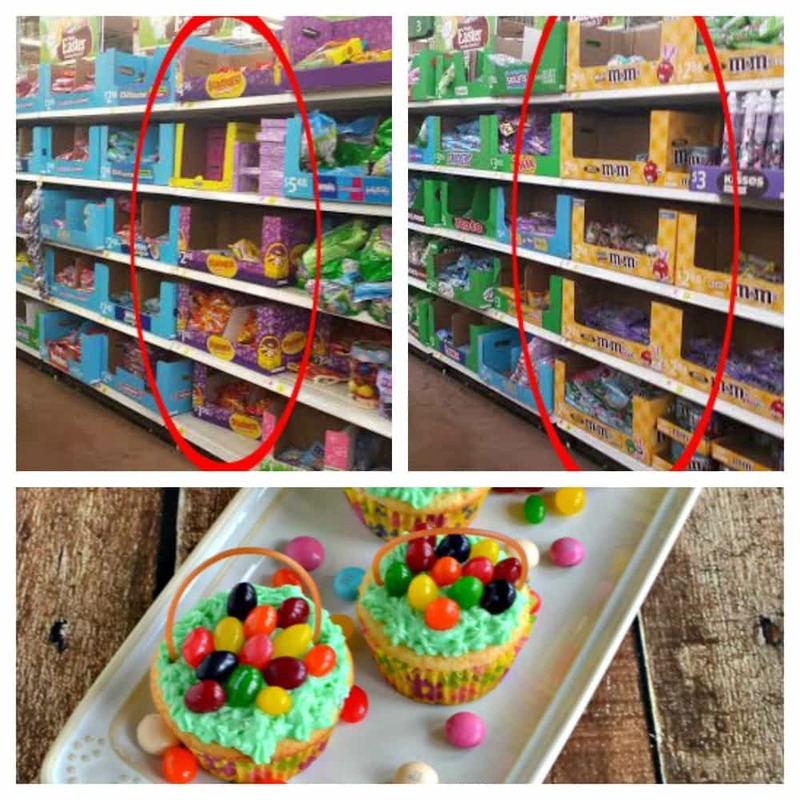 I went to Walmart because they are the only place that carries M&M’s® Easter Sundae and I wanted to buy a few bags to use in my cupcake recipe. They are available for a limited time so I wanted to stock up while I could. I was using the M&M’s® Easter Sundae in the cake part of my cupcake. 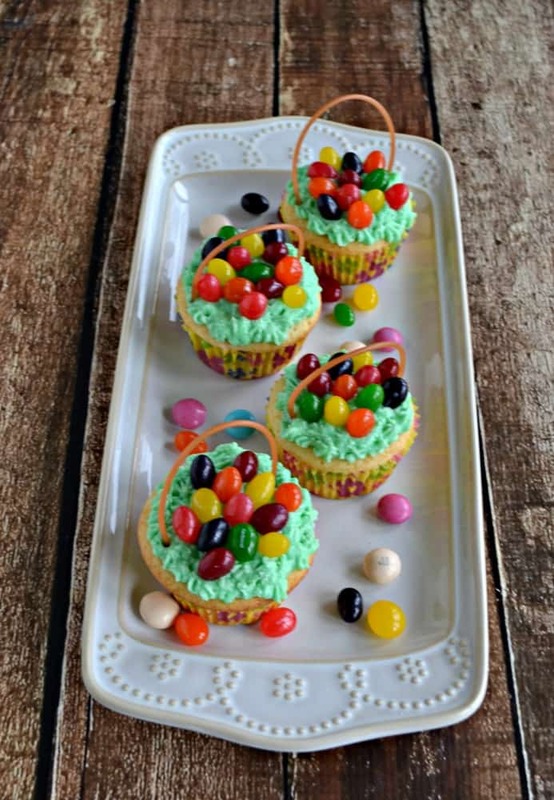 I had plans to buy Starburst® Original Jellybeans to use as “eggs” on top of my Easter cupcakes. I found both of these candies in the Easter candy aisle and also found a few other treats for the Easter basket. 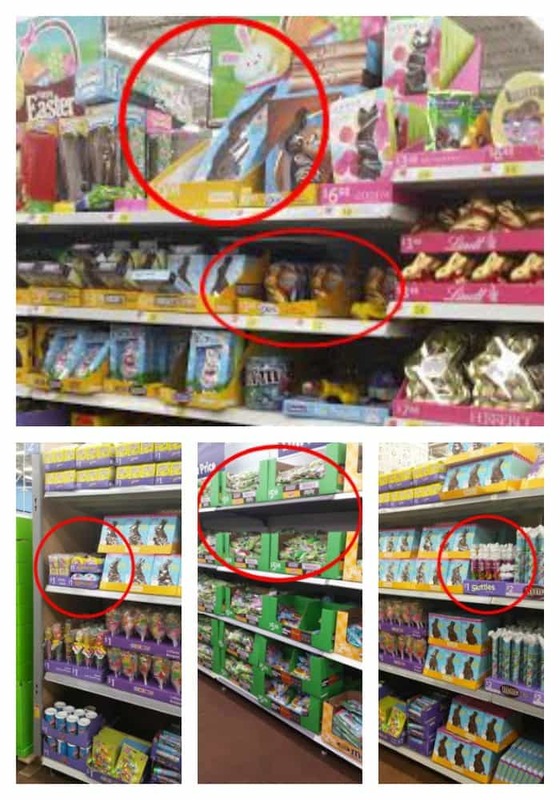 I bought a large 12oz DOVE® Milk Chocolate Easter Bunny that I thought I could put next to the basket since there was no way it was fitting inside the basket. 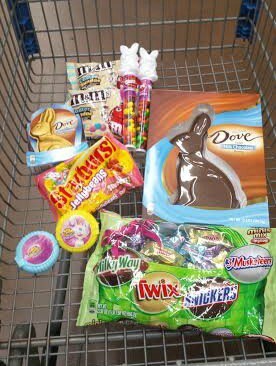 I picked up a few other treats and headed for the check out. Once I was home I found some cute Easter cupcake wrappers. They were bright yellow with pretty flowers all over them. 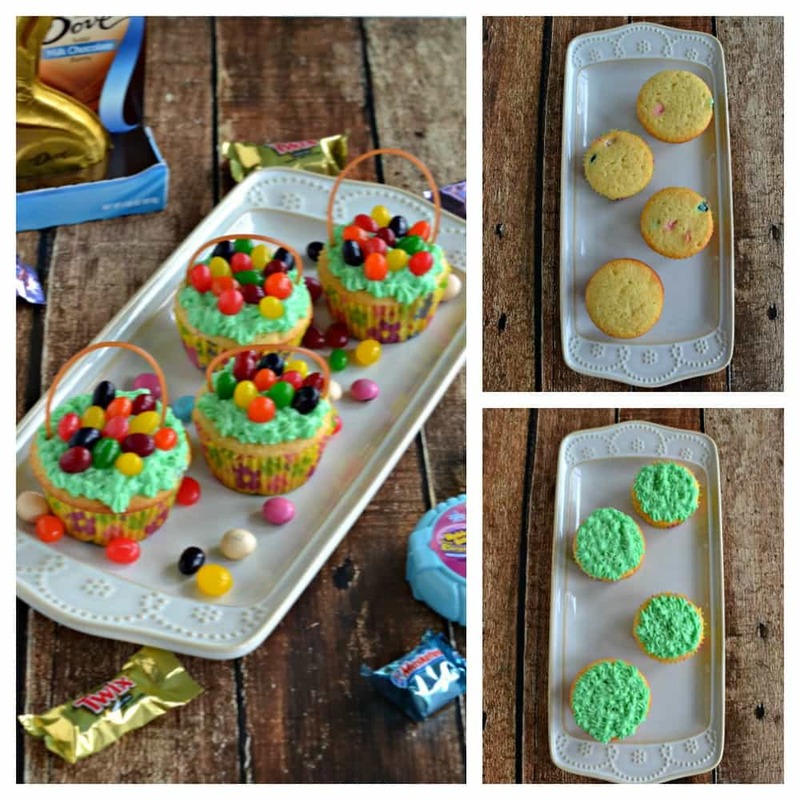 I whipped up a batch of yellow cupcakes and added the M&M’s® Easter Sundae to the mix. I put them in the oven and then started on the Easter basket. I bought a small basket and filled it with paper Easter grass and started building from there. Since i couldn’t fit the large 12 oz. 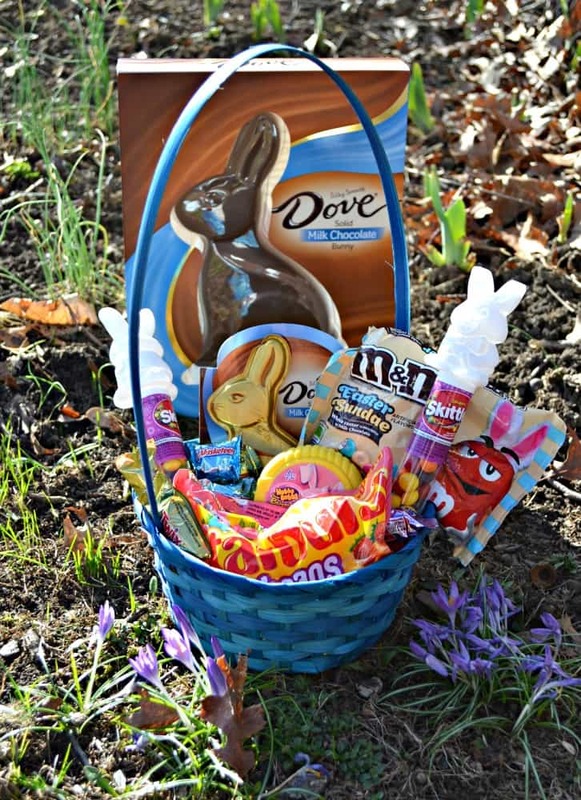 DOVE® Milk Chocolate Easter Bunny in the basket I bought the smaller 4.5oz DOVE® Solid Milk Chocolate Bunny to put in the actual basket. I placed the bunny in the back of the basket since it was tall and I knew it would stick out. Next I put in a bag of the M&M’s® Easter Sundae because I really thought my mom would like them. I found Hubba Bubba® Bubble Tape and cute Skittles® tubes tubes for $1 each so I bought two of each to put in the basket. In the front of the basket I put a bag of Starburst® Strawberry Jellybeans. At this point the basket was getting full so I finished it off by opening a large bag of Easter Mixed Brand Chocolates (including SNICKERS®, DOVE®, M&M’s®, TWIX®, MILKY WAY®, 3 Musketeers®) and sprinkled them in the basket to fill in any holes. I then put 2 gift cards in the back of the basket and I was finished. The Easter basket looked awesome! By then the cupcakes were finished so I pulled them out of the oven, let them cool, then frosted them with green frosting. I put the Starburst® Original Jellybeans on top to make Easter eggs and then an edible handle in the top. I packed 11 cupcakes in my cupcake carrier and put the 12th one in my mom’s Easter basket. She was going to love it! 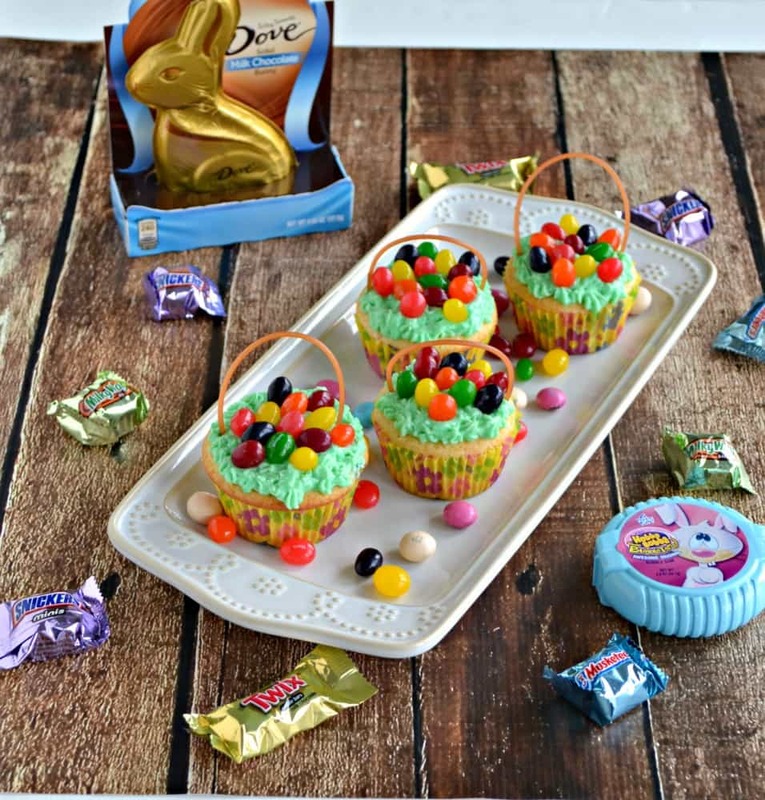 I had so much fun shopping for all the Easter candy and making the adorable Easter Basket Cupcakes. My mom totally loved it all! I’m planning on making these cupcakes to take in to work for the teachers next week as well. They are easy to make and just too cute to keep to myself! 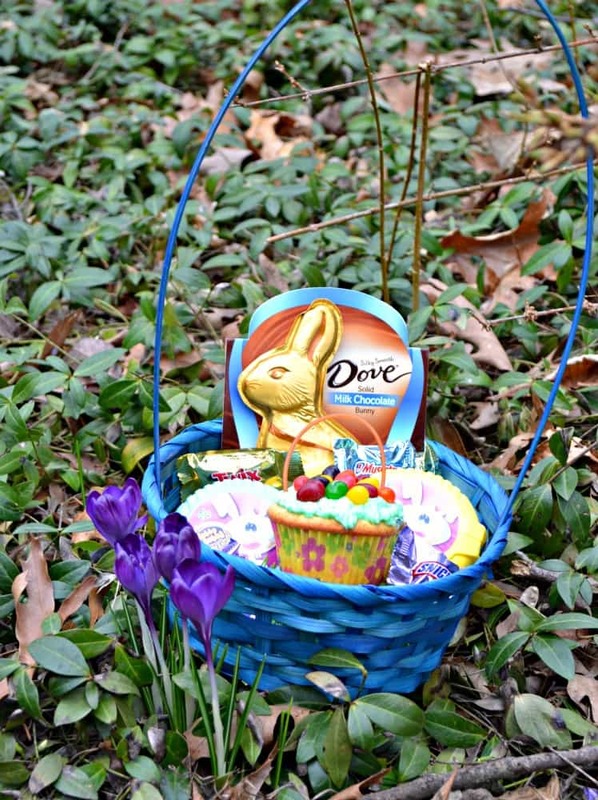 Are you looking to make your own Easter basket? Click HERE for a coupon to save $1.00 on any TWO (2) M&M’s® bags, DOVE® eggs (8oz or larger), SNICKERS® or TWIX® Easter Minis (11oz or larger). Preheat the oven to 350 degrees. Line a muffin tin with 12 cupcakes liners. Set aside. In a large bowl cream together the butter, Greek yogurt, and sugar. Add in the eggs and mix until well combined. Stir in the vanilla. Add the dry ingredients to the wet ingredients and mix well. Stir in the milk. Gently fold in the M&M’s® Easter Sundae. Divide the batter between the 12 muffin cups, filling them each ¾ of the way full. Bake for 20-25 minutes or until a toothpick inserted into the center comes out clean. Cool completely on a wire rack. To make the frosting put the butter in a bowl and mix on medium speed until whipped. Add in the vanilla and milk and mix on medium speed for 1 minute. Add the powdered sugar a half cup at a time until desired consistency is reached. Stir in the green food coloring. Put the frosting in a piping bag and pipe onto the cupcakes to make it look like grass. I used a star tip and it gave the frosting a lot of dimension. 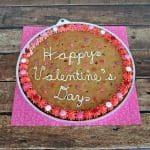 To make the edible handles place the water, sugar, and brown food coloring in a medium saucepan. Bring to a boil over high heat. Add in the spaghetti and cook for 3-4 minutes or until the spaghetti just begins to bend. Do not fully cook it! Immediately take the strands out and shape them into a semi-circle. If they keep breaking put them in the pot for an additional minute. Allow them to cool on a baking sheet. 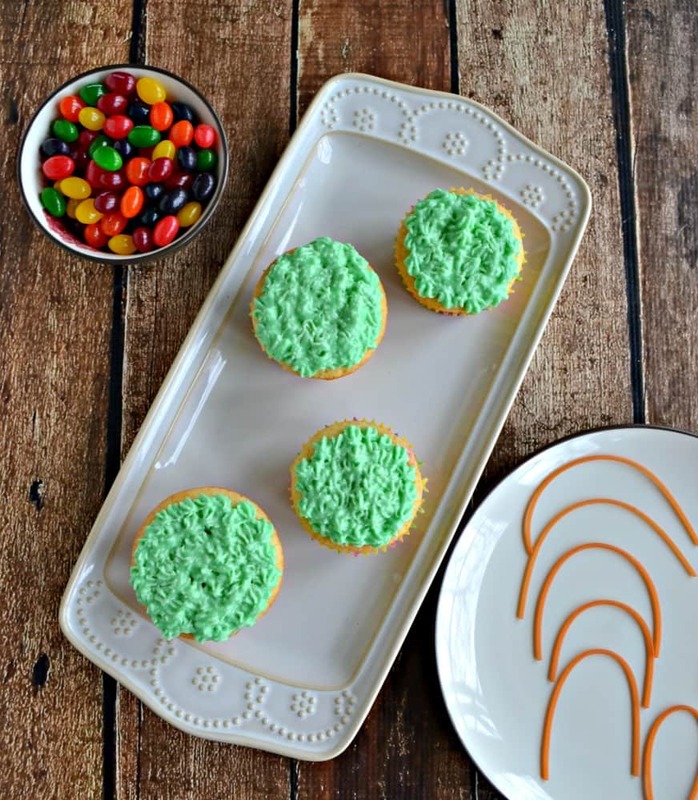 To decorate the cupcakes put about 10 jellybeans on top of the cupcakes. Take a toothpick and poke a whole in the top of the cupcake on two opposite sides. Pick up the cooled spaghetti and stick one end into each toothpick hole to make the edible handle. 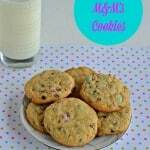 Want to try this recipe for yourself? Get a coupon HERE to save $1.00 on any (2) bags of Starburst® Jellybeans (13oz or larger). I want to hear from you! 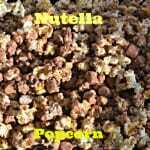 Make sure you click HERE and tell me which recipe or basket idea you most want to try! All the teachers at work loved them!